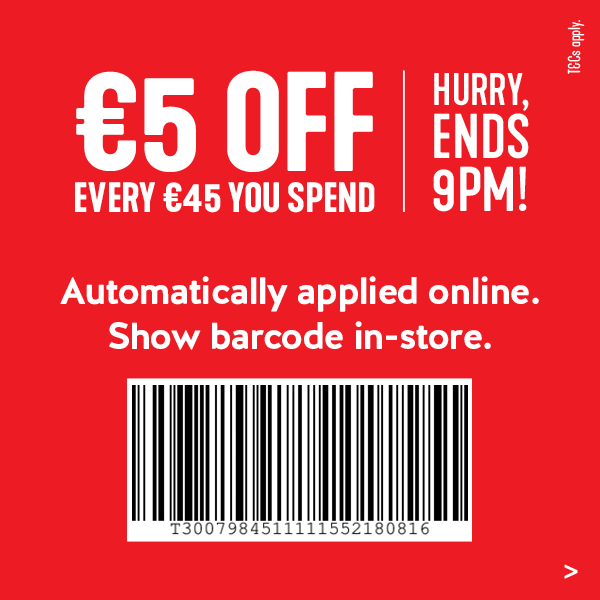 Offer entitles the customer to €5 off every €45 spend in a single transaction, up to €495 or more spend. Redeemable in Holland & Barrett UK stores and online at www.hollandandbarrett.ie between 08.00 am on Tuesday 26th March 2019 and 09.00pm on Sunday 31st March 2019 only. Specified amount will be awarded once per transaction and will be deducted from total basket spend once qualifying amount is reached and after all other discounts are applied. Offer can be used with bonus points offers, reward coupons and ‘Half Price Sale’ but cannot be used with any other discounts, promotions or offers on total transaction spend. All orders subject to availability. We reserve the right to retract this offer at any time.